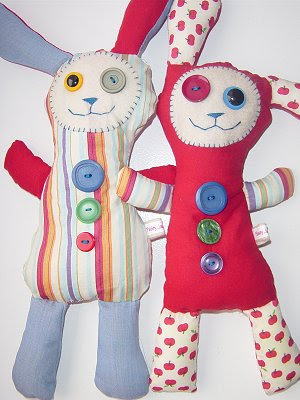 Taadaa - two little Ugly Bunnies have been added to the shop and are waiting to be adpoted. Totally love these guys - Ernie and Bert. Have always wanted to use buttons more with softies, so watch out for more Ugly Bunnies coming soon... although I think they are actually quite cute! Adorable! The red one is especially cute!! I can't choose..they're both too cute! hahaha burton ernie hahaha good times! Burton Ernie? Are you sure you're on the right post??? hehe those are too cute! They are definately not ugly bunnies! Love them Kris, you are so creative and inspiring.